Goodreads says, "It starts with a whisper: “It’s time for you to know who you are…” Violet Eden dreads her seventeenth birthday. After all, it’s hard to get too excited about the day that marks the anniversary of your mother’s death. As if that wasn’t enough, disturbing dreams haunt her sleep and leave her with very real injuries. There’s a dark tattoo weaving its way up her arms that wasn’t there before. Violet is determined to get some answers, but nothing could have prepared her for the truth. The guy she thought she could fall in love with has been keeping his identity a secret: he’s only half-human—oh, and same goes for her. A centuries-old battle between fallen angels and the protectors of humanity has chosen its new warrior. It’s a fight Violet doesn’t want, but she lives her life by two rules: don’t run and don’t quit. When angels seek vengeance and humans are the warriors, you could do a lot worse than betting on Violet Eden…"
Violet Eden is a normal teenage year old girl trying to find her place in the world until her birthday comes along. Every year Violet's birthday is emotionally hard since it reminds her of her mother. Her mother died tragically giving birth to her. Things start to get peculiar around her seventeenth birthday. Violet starts to notice a weird tattoo on her arm that won't go away and she is having strange dreams. She finds comfort by hanging out with her good friend and physical trainer, Lincoln. The problem is that she harbors strong feelings for Lincoln, but has never said anything to him about it and her best friend, Steph, has encouraged her to finally bring it up. Just when Violet is about to, she finds out that Lincoln has been keeping a major secret from her (she's half angel and so is he!) and feeling betrayed, she falls into the arms of newcomer and resident bad boy, Phoenix. Violet is learning more and more about her heritage, her mother, and what she finds out will change her life forever. Jessica Shirvington's Embrace is to-die-for, especially if you are a fan of paranormal romances. 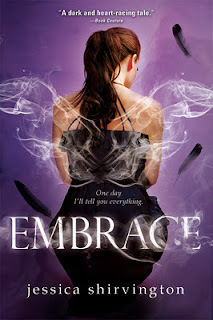 I love me a good angel book and Embrace is no different. I find Shirvington's version of angel mythology extremely captivating. I liked how a person can decide to "embrace" their destiny, the battles between light and dark, the angelic hierarchy, the assigned partners, etc. Shirvington did a great job with her world-building and I'll tell you what...this is a world that I would gladly live in. I also really enjoyed the character of Violet and could feel for her. She had to make some major choices in Embrace that weren't easy. Half the time, she's in between a rock and a hard place. Shirvington did a wonderful job keeping readers on the edge of their seats as we wait to see how Violet will handle many of the big decisions she needs to make all while doing this without much parental support or guidance. I cringed when I realized that there's a love triangle in Embrace, but I must admit, it was a delicious guilty pleasure. Lincoln is such a good guy and you can't help but feel badly for the situation he is in regarding Violet's secret. Then we've got Phoenix who is just as captivating and mysterious. It reminded me a bit of the love triangle in The Vampire Diaries (the TV show, not the books!) and if you know me, that's a compliment. So, needless to say, the love triangle was done really well and only added to my enjoyment. Sure, there were some cheesy and slightly cliched moments, but I didn't mind. It worked for Embrace and I am DYING to read the second book in the series, Entice. It comes as no surprise to me that Shirvington's Embrace series is popular in her homeland of Australia. I bet this series will be just as popular here; in fact, word on the street is that the CW is in the works to make the Embrace series a new TV show. Maybe it will come on after The Vampire Diaries and then I will have two hours of pure indulgence! Yes, please! So glad you liked this one Christina! I had a little trouble with Violet in this one due to her attitude toward Lincoln, and though her behavior was fully explained by the end, it didn't quite warm me to her. I fell in love with her in Entice though:) I agree the love triangle was well done in this book for sure, thoroughly enjoyed it. Can't wait to see what you think of the next book! Ohhh! I can't wait to read Entice then. Thanks for visiting, Jenny! I love the love triangle in The Vampire Diaries also, so maybe I will check this one out after your comparison! That's really cool that they might turn it into a tv show! I will definitely have to read this before the premiere! ;) Thanks for sharing! I am pumped that it is going to be a TV show as well. I hope you get your hands on a copy soon! I've been seeing Embrace and Entice everywhere and I have yet to read it. I love TVD, so I'm so glad to know the love triangle is similar to it as I've kind of become wary of them. Also, I love a strong heroine and Violet's character fits the bill. So glad that you liked this one. In all honesty as much as I enjoyed Embrace, I loved Entice so much more!! Can't wait to see what you think of that one. This is an amazing series and I can't wait to find out what happens next! That's what I hear, so I am definitely excited to read Entice. It is moving higher up on my TBR list. Thanks for visiting, Andrea! I may have to get a copy from the library and try it anyway. I read a lot of different books, my one main requirement is that they need to be entertaining. I don't need to bond with the characters or respect and judge their choices. Just like a book I don't want to put down and this was one of them. Looking forward to the third book. I really appreciate your comments. Thank you! Hi, I'm Christina. Welcome to Confessions of a Book Addict! I've been blogging since December of 2009. Take a look around! Confessions of a Book Addict by Christina is licensed under a Creative Commons Attribution-NoDerivs 3.0 Unported License.